Informa web site about our workshop. On November 9th, Peperoni will led a post-conference workshop titled „The Marketing and Technology Necessary for Establishing a Successful Mobile Community“ before the conference „Mobile Communities & User Generated Content – Determine the Impact of Community Services and User Generated Content on Your Business“ in London. Technology: What technology is behind one of the most successful mobile community services available today? Marketing: How to leverage viral marketing aspects that come with every successful mobile community and what else will be necessary to be successful? Mobile operators, web-based social networks, consumer brands and music labels alike are addressed by the topics set out in order to help them launch a successful mobile community or user generated content service based on their core offering. The workshop will be a combination of presentations based on actual cases and discussions driven by the most urgent questions and needs from the auditorium. The presenters aim to provide everyone with input based on their specific case to help them in making the most out of the chances presented by mobile web 2.0. 10:00 – 10:40 What happens behind the scenes when a mobile site is delivered to an end device? 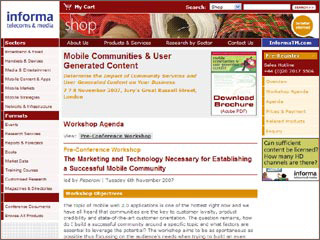 Peperoni Mobile & Internet Software GmbH is a leading provider of mobile user generated content applications and has invented mobile site building in 2001. They provide customers both on- and off-portal worldwide with virtual communities. Besides applications they host and develop on their own, Peperoni works together with numerous network operators like T-Mobile, O2, E-Plus, TIM, Orange and Vodafone to name a few. Their network of mobile sites is the largest in the world and is growing at fast rates. The workshop will be led by Marcus Ladwig, COO and Maciej Kuszpa, CEO. More Information about the Workshop and the registration on the website of Informa.